I never can have enough Cutting Boards! Hurry over to get this Farberware 3-Piece Wood Cutting Board Set with Drip Groove on sale for $11.99 when you clip the $5 off coupon (Retail $29.99)! This Farberware 3-Piece Assorted Wood Cutting Board Set with Drip Groove includes (1) of each of the following cutting boards: 17.5-inch by 11.5-inch, 11.5-inch by 9-inch and 8.75-inch by 6.5-inch. The boards are made of farm-grown hardwood, are pre-sealed with food-grade mineral oil to keep them from drying out and feature reversible working surfaces. 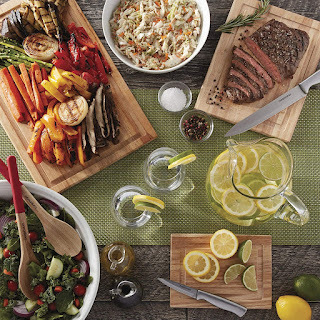 Each board features a grooved channel that is designed to catch drippings and juices from carved meats.